sWeather is a tray-based weather app featuring multiple location support, a 5-day forecast and integrated WOEID (Where on Earth IDentifier) searching. Optional, customizable tray icons are available for conditions and temperature. Weather data is provided by Yahoo! Weather. How to extract: Download the ZIP package and extract to a folder of your choice. Launch sWeather.exe. A great application: small, fast & beautiful. sWeather is 1st class for GUI and data, NirSoft's mWeather is 2nd for data. MetarWeather decodes weather reports from around the world and displays them in a simple weather report table. You can export the weather report into text, HTML or XML files. MetarWeather can decode METAR-format reports from a text file, or download the latest reports. How to extract: Download the ZIP package and extract to a folder of your choice. Launch mweather.exe. Extremely fast and lightweight. Use this more than any other weather app. Makes it easy to compare weather reports from multiple areas. AVG quarantined this when I installed - triggered by AVG's "behaviour shield". @IanFromBarrie: please post about virus threats to the forums. Thanks. WeatherMate gives you instant access to current weather conditions and forecasts for tens of thousands of locations worldwide. The program includes a customizable interface, radar images, severe weather alerts, a variety of maps and can even speak the weather. Temperature can be displayed in Celsius or Fahrenheit and various weather forecast formats are available. How to extract: Download the ZIP package and extract to a folder of your choice. 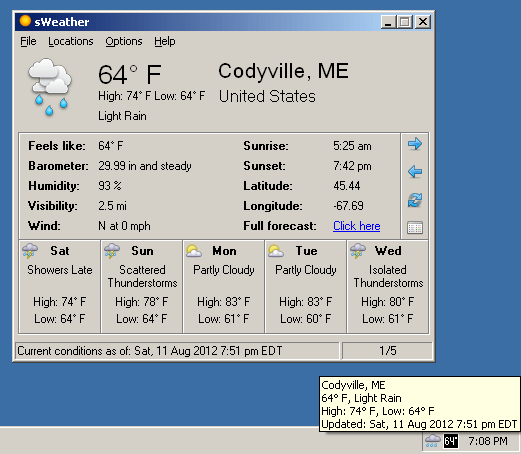 Launch WeatherMate4.exe. Version 4.9 available on site. PicoWeather is a weather monitoring utility that sits in the system tray and tells you the weather condition and temperature of your current location. It obtains the weather information from Yahoo. How to extract: Download the standalone EXE to a folder of your choice. Rename picowet-x.y.z.exe to picowet.exe and launch. I have have no luck in getting this program to work.